Subwoofers are crucial to the home theater experience. When you go to the movie theater, you marvel not only at the images projected on the screen, but the sounds emanating around you. What really grabs you, though, is the sound you actually feel; the deep bass that shakes you up and gets you right in the gut. To get this experience at home, a home theater receiver provides an output referred to as a Sub out, Sub Pre-Out, or LFE (Low-Frequency Effects) output. This is where you need to connect the subwoofer in order to use it. Passive subwoofers are powered by an external amplifier, in the same fashion as other speakers in your system. To use a passive subwoofer in a home theater setup, the best solution is to place an external subwoofer amplifier between the passive subwoofer and your home theater receiver's subwoofer preamp outputs. This will free the receiver from having to supply the needed amplifier power for the subwoofer. Since extreme low-frequency bass output needs more power to reproduce low-frequency sounds, If you opt to connect a passive subwoofer directly to speaker terminals on the receiver like you connect your other speakers, instead of putting a separate amplifier between the sub and receiver, the receiver will need to be able to output enough power to sustain bass effects in the subwoofer without draining the amp. How much power depends on the requirements of the passive subwoofer, the size of the room, and how much bass you desire. The most common type of subwoofer is one that is self-powered. These means that they have their own built-in amplifiers - with the amplifier and subwoofer speaker optimally matched. Powered subwoofers usually provide their own volume (gain) and other setting controls that can be adjusted separately from the home theater receiver, if desired. 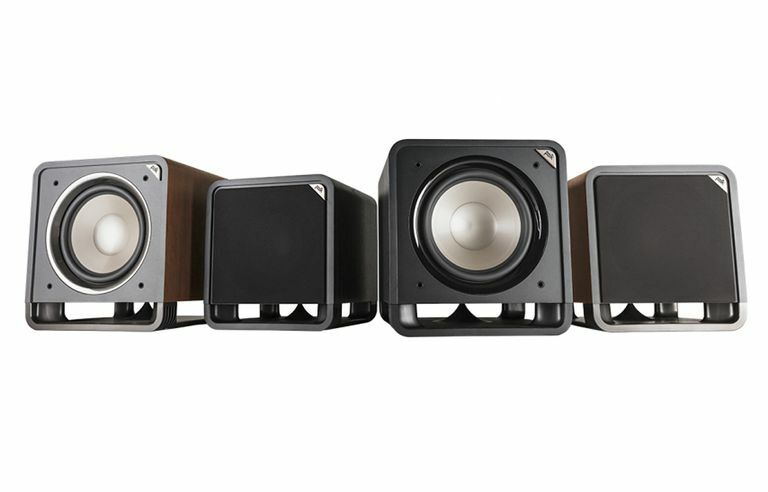 All a powered subwoofer needs (in addition to AC power) is a connection to the Sub output from a receiver that was mentioned previously (you don't have to put an extra amp between the subwoofer and the receiver). This connection setup takes the audio power load away from the amp/receiver and allows the amp/receiver to power the mid-range and tweeters more easily. Front-firing (or side-firing) subwoofers employ a speaker mounted so that it radiates the sound from the side or front of the subwoofer enclosure. Down-firing subwoofers employ a speaker that is mounted so that it radiates downward, towards the floor. Both types can deliver similar results - but some feel that a front firing sub is best for placement in the front of the room and down-firing subs deliver the best results when placed in a corner or side wall. Also, with a down-firing sub - be careful when you move it around so as to not puncture the driver when you pick it up or set it down as it is exposed. Some subwoofer enclosures also employ an additional port, which forces out more air, increasing bass response in a more efficient manner than sealed enclosures. Another type of enclosure utilizes a Passive Radiator in addition to the speaker, instead of a port, to increase efficiency and preciseness. Passive Radiators can either be speakers with the voice coil removed or a flat diaphragm. Instead of vibrating directly from the electrically transmitted audio signal, a passive radiator reacts to the air that is pushed by the active subwoofer driver. Since the passive radiator complements the action of the active driver, it helps to increase the low-frequency response of the subwoofer. The crossover is an electronic circuit that routes all frequencies below a specific point to the subwoofer; all frequencies above that point are reproduced the main, center, and surround speakers. Typically, a good subwoofer has a "crossover" frequency of about 100hz. Gone is the need for those large 3-Way speaker systems with 12" or 15" woofers. Smaller satellite speakers, optimized for mid-and-high frequencies, take up much less space and are now common in many home theater setups. Since the deep-bass frequencies reproduced by subwoofers are non-directional (as frequencies that are at or below the threshold of hearing). It is very difficult for our ears to actually pinpoint the direction the sound is coming from. That is why we can only sense that an earthquake seems to be all around us, rather from coming from a particular direction. After you buy your subwoofer, you need a place to put it. Since the low frequencies reproduced by a subwoofer are non-directional, it can be placed anywhere in the room where it sounds best. Optimum results depend on room size, floor type, furnishings, and wall construction. Typically, the best placement for a subwoofer is in the front of the room, just to the left or right of the main speakers, or in a front corner of the room. Also, many home theater receivers provide two subwoofer outputs - which enables more flexibility if you find that one subwoofer does not provide the results you are looking for or have a large room. A growing number of powered subwoofers offer wireless connectivity. This makes a lot of sense for powered subs as they have their own built-in amplifiers. The wireless capability also eliminates the need for a long connection cable between the subwoofer and home theater receiver. A wireless-enabled subwoofer usually comes with a transmitter kit that can be plugged into the subwoofer outputs of any home theater receiver. The transmitter connected to the home theater receiver transmits the low-frequency audio signals to the wireless subwoofer, and then the receiver built into the subwoofer allow built-in amplifier in the subwoofer to power the speaker driver to produce the needed low-frequency sound. Despite all of the technical specifications and cabinet designs, the type of subwoofer you choose for your system depends on the characteristics of the room and your own preferences. When you go to a dealer, take a favorite Blu-ray Disc, DVD and/or CD that has a lot of bass information and listen to how the bass sounds through various subwoofers.